Traveling with a family of techies will no longer be a problem with the Linksys travel router around. A hotel room with just one Internet port can be instantly transformed into a mini hotspot. Picture this: You are on a vacation together with your wife and your two teenage sons and got yourself a reservation at a local hotel. On the hotel room, there’s only one Ethernet port on the wall which means that there will only be one computer that can go online, and the hotel has no wireless internet connection. You brought your iphone and your laptop with you, and each one of your family members brought his own laptop, too. It would be frustrating for the whole family to have to wait for their turns to surf the web. The Linksys Wireless-G Travel Router with SpeedBooster (WTR54GS v2.0) would be the perfect solution for this kind of situation. This travel router enables you to both a hardwired and wireless Internet connection. In setting up the router, just wire the hotel room’s Internet connection cable to the router port, and then wire one of your computers to the router’s Ethernet. Power up the travel router and check the LEDs on the router. All lights should be lit. When your hardwired computer is already powered-up, just launch an Internet Explorer browser and type in 192.168.16.1 on the address bar then press enter. It would prompt you with a username and password. Just ignore the username and on the password field type in “admin”. Once you’re on the web-based setup page already, you can configure the router from there on in. First, click on the radio button that says “Wired” if you want to have a wired internet connection, but if you want to go wireless then just choose “Wireless”. You have to know the type of connection the hotel’s internet provider is. You can click on the wireless tab and under basic wireless settings, the Wireless Enabled radio button should be clicked on, the Network Mode should be mixed, and you should change the Network Name (SSID) to customize your settings. The channel should be 6 and SSID Broadcast should be enabled. Click on the Wireless Security subtab and click on the dropdown arrow of security mode and choose WEP. The Encryption must be 64-bit, tx key is 1 and type in your 10-digit phone number on the WEP Key 1 field. It is also important to upgrade the firmware of your router. You can always get help from any of the Linksys technicians over the phone by calling 1800LINKSYS (1800-5465797) and they will configure your router as well as upgrade your router’s firmware. 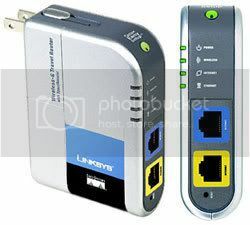 I recommend a Linksys travel router because I like its Speed booster capabilities and its travel-friendly design which is small and lightweight. It has a built-in firewall and the internet connection is great. What I love the most about this brand, though, is its very friendly technical phone support agents. If you aren’t a techie, you’ll definitely feel no frustration setting this up with their assistance.